Below is a haunted house movie with a twist. Instead of a gothic mansion, the film is set aboard an American submarine during WWII. After a British hospital ship is torpedoed by Germans, the USS Tigershark is sent to rescue the survivors. Lieutenant Brice (Bruce Greenwood, Star Trek ) barely has time to welcome Nurse Claire Paige (Olivia Williams, The Sixth Sense ) aboard before they're spotted by a German warship. The Tiger Shark tries to escape by submerging and running silent, but a phonograph mysteriously screeches to life, and the crew is lucky to survive the ensuing depth charge attack. Lt. Brice suspects the Brits of sabotage. When he learns one of the injured patients is really German POW, he pulls his sidearm, and despite Nurse Paige's protests, puts a bullet in the man's head. Later that night, the phonograph once again awakens, belting out a taunting song that clears the German's name. The movie is full of clever little touches. When Lt. Brice was introduced, I laughed at how awkward the actor looked in his ill-fitting Captain hat. But we soon learn why: Not the type to remain confined to her room, Nurse Paige pokes around the Captain's quarters. There she learns Lt. Brice has only been in charge for a few days. What happened to the Captain? And why is everyone starting to hear voices echoing through the submarine? These questions will have to wait, as they spot the German warship on the horizon, an ominous specter billowing black smoke. When they seek refuge on the ocean floor, the warship drops giant grappling hooks, which tear into the submarine like claws. The sub is damaged. Carbon monoxide levels are on the rise. People are starting to see things. They need air, which means they need to surface. But first they have to lose the warship. Director David Twohy ( The Arrival , Pitch Black ) makes excellent use of space. The submarine looks much less cramped than you'd expect. When sexist ignoramus Stumbo (Jason Flemyng) runs along a corridor, warning everyone there's a dame aboard, the tracking shot makes it look like a small, bustling city. Usually a film like this would whittle down a small cast one by one. But not Below , whose script, written by Twohy and Darren Aronofsky ( Black Swan , The Wrestler ) offers a large cast of character actors. Some are given only a few lines, but they are all distinct. First Mate Loomis (Holt McCallany, Fight Club , Alien 3 ) is an overbearing meathead who at times seems to be running things. Weird Wally -- played by Zach Galifianakis, before anyone knew who that was -- is introduced reading stories from a magazine of weird fiction. When the crew laughs at Weird Wally's use of the word "malediction," he snaps, "Look it up!" You know you're dealing with a quality horror movie sidekick when he crafts a protective amulet out of Crackerjack prizes. The only crew member who comes off as milquetoast is resident boyscout Odell (Matthew Davis, The Vampire Diaries ), though perhaps that's by design. Below is well written, directed, and populated by a cast of interesting characters. What could possibly go wrong? Well, notice I haven't mentioned the editing. The movie is careful never to reveal whether or not they're plagued by -- as Weird Wally would put it -- maledictions, or just a series of mechanical failures leading to oxygen-starved hallucinations. But one early jumpscare veered off into "definitely haunted" territory. While investigating the Captain's quarters (long before lack of oxygen should be an issue), Paige has what appears to be a clear supernatural encounter. On the script, it's all very subtle: Paige thinks she hears a voice, she finds a photograph, she wonders who it is. But in the film? The closet slams open, and Paige is assaulted by a series of strange, rapid-fire visions, closeups of the dead man's face. Artistic license? Sure. But in a movie whose last line continues to question whether there are ghosts, the final version of this scene all but confirms the supernatural. I'm reminded of Devil , a whodunit in which one of the people trapped in an elevator might be Satan. Midway through, a woman is assaulted by horrifying visions. Logically, we can rule her out -- the scene is shot from her perspective, and there's no reason the Devil would scare itself. And yet, the movie stupidly continues trying to pass her out as a possible suspect. Below isn't quite that bad, but whoever's responsible for this critical mistake deserves to be keelhauled. David Twohy tends to make movies that are far better than they should be. The Arrival (1996), an alien invasion thriller starring Charlie Sheen, could have been Syfy-worthy. Pitch Black (2000) was an Aliens clone, long after everyone stopped making those. Riddick was a space western opening with a dialogue-free struggle of Man vs. Nature. And of course, Below , a nautical horror movie, released more than a decade after the big boom of '89. By all rights, it should have been as forgettable as Ghost Ship , released the same year. Instead, Twohy and Aronofsky deliver something special, a sunken haunted house story, held together by a solid mystery. With better editing, this would receive my highest recommendation. 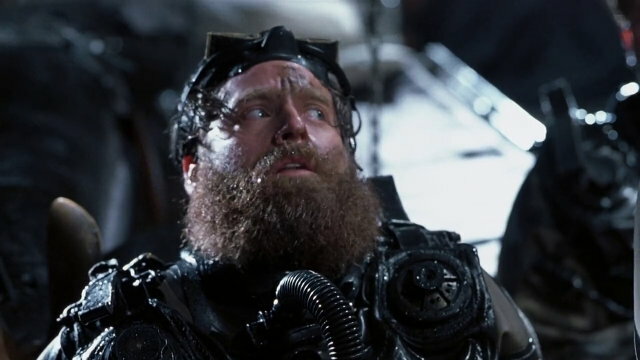 As is, you'll be hard pressed to find a better horror movie set on a submarine, or co-starring Zach Galifianakis.